Well a few years back I started looking into the Hussites military structure as best a person without german and czech could (I can read latin, old english, and anglo-norman, as usually happens in life). It is funny how little is out there on such an interesting group but there are a few things. One issue I have come across is that secondary sources speak hopefully on the war wagons but ALL always of huge numbers of handguns and artillery as the key but rarely/never list primary sources. This could be ok if I checked their secondary source and found a primary one but usually I do not. So my own looking has been limited to German and Czech primary sources translated into English but from what I can tell the Flail and halberd appear to be the primary weapon well over 50-60 percent armed with them. It also mentions artillery use at times but when they take cities by force it is not usually with them, the vast majority are taken by escalade, usually in suprise. In fact I have found many more numbers of crossbows listed than handguns in most places. This makes sense considering the Hussites own Hodetin Ordinance was 2 drivers, 2 handgunners (possibly a team as is in artwork of the time), 6 crossbowmen, 14 flailmen, 4 halbardiers and 2 pavisiers per wagon, which as most medieval ordinances was taken as more a guide than a rule. It seems that the primary sources I have read speak of the dreaded war flail the most but is has no coverage in secondary sources on its use as far as I know anywhere. A two handed flail (mace) is fairly unique from what I have seen so why is the weapon that everyone used to such effect so abandoned? I guess my question is anyone know of good primary sources for hussites that indicate this? Has anyone else done reading on them? We have some people all over the world here so I would love help if someone has ready the some of the majority of primary sources still untranslated to English. Now that I think of it, you should pick up a copy of the inexpensive Complete Woodcuts of Albrecht Dürer (Dover edition). Dürer shows every manner of polearm in various scenes, and these illustrations are primary documents. There have been similar discussions about the English longbow, as I'm sure you know. One provocative suggestion is that the longbow became obsolete not because it was inferior to early firearms but because, for reasons too numerous to cite here, England had fewer and fewer men raised to shoot in the longbow. Maybe similar economic/cultural/technological processes killed the flail. But why was the flail considered so effective? Range and power, I suppose. Same reason the simple quarterstaff is/was so respected and feared. Personally, if I knew how to use one I'd certainly prefer a flail (or any other polearm) to a sword in single combat. Funny that one's intitial perception is that the flail is a very crude weapon. In fact, it's much more sophisticated than many polearms simply by virtue of having moving parts, and probably demands unique expertise as a result. I just remembered another source that might be of use: Anglo's Renaissance Martial Arts. This is a serious academic work, so the bibliography is full of primary docs, IIRC. 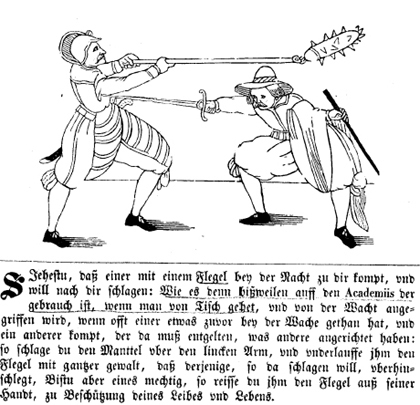 And speaking of flails in primary documents, Jakob Sutor's fechtbuch of 1612 shows at least one flail in use, and shows how a swordsman can get the best of him (polearms are great as long as you're skilled enough to keep your opponent out at the business-end. If you allow him to close and can't defend with the haft...well....). See http://www.thearma.org/manuals.htm for the full PDF of this and other manuals. Thanks for the info Sir! Very interesting. I thank you for your help. I think it is an interesting weapon for sure. I made one that I used to spar with but went back to a pole axe as it was easier for me. I will look into those books, the British Library should have them I think (have most everything). I think you are likely right about the flails decline (I figure the longbow was that was indeed as well) it just becomes easier to gather thousands of musketeers than longbowmen. At one point Charles II frustratedly states there are not a man that can draw a good bow left in his kingdom. Thanks again Sean very good stuff! Any more primary sources on hussites translated to English? It says "moved" because it was moved from Historic Arms Talk to Off-Topic, where it should have been posted. Since your topic is not specifically about arms & armour but rather a group of people, this is where it goes.